SANTOS'S GLNG project has reached another milestone with completion of its 4.3 km tunnel under The Narrows. 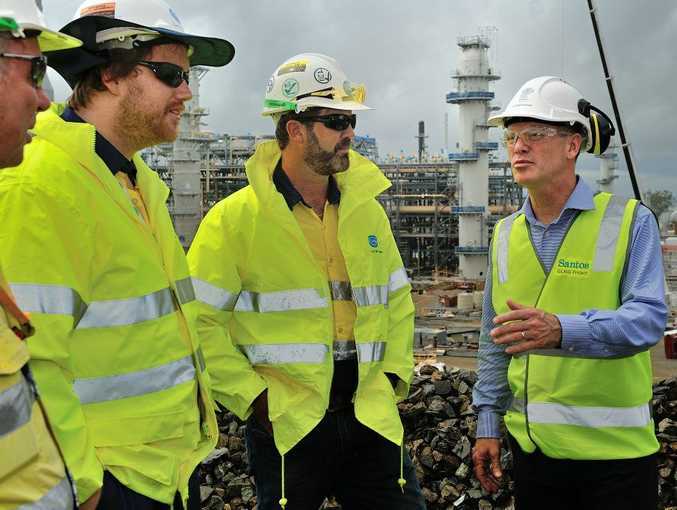 Premier Campbell Newman toured the GLNG site on Tuesday, as Santos announced its $20 billion project was 75% complete and ready for first gas next year. 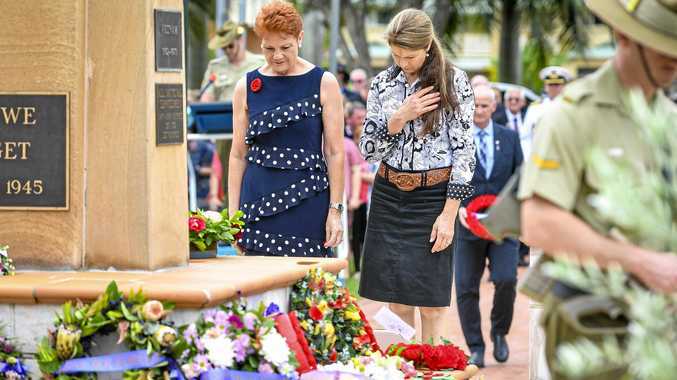 Dismissing concerns about the shrinking construction workforce, Mr Newman said there were already people who had left the projects in Gladstone, who had moved on to other gas and LNG projects around Australia. "They are a mobile workforce," he said. "They've got specialist skills and they go to where the projects are, but this government will do everything we can to see gas continue in this state." Mr Newman said he was looking forward to his upcoming visit to Houston, where he would spruik the great LNG story of Queensland and tell them "we are open for business". Santos chief executive David Knox said while the investment and economic contribution of Australia's gas industry was important, "the real value will be measured by our ability to operate responsibly". "Santos GLNG has provided $5.1 billion worth of work to Queensland businesses and over the coming decades will contribute billions of dollars in royalty payments to the people of Queensland," he said. "By increasing supply we will keep oil prices under control." EARLIER: QUEENSLAND Premier Campbell Newman has joined Santos CEO David Knox on a visit to Curtis Island to mark the 75% completion milestone at the GLNG project. The Santos GLNG project is on track for the first shipment of LNG to sail out of Gladstone Harbour next year. With the 6000-strong workforce delivering about 4.5 million work hours so far this year, Santos GLNG has already achieved a number of construction milestones in 2014, including the breakthrough of the pipeline tunnel underneath Gladstone Harbour and the completion of the final modules which will form the first LNG processing train. "We're delighted to host the Premier to mark 75% completion of this truly world-class project, and thank him for his strong support in making this state a world-leading gas producer," Mr Knox said. "As an Australian owned and operated company, we are very proud to be building this new industry for Queensland. "We have had a home in this state for over 50 years, and it represents a hugely important part of our future. 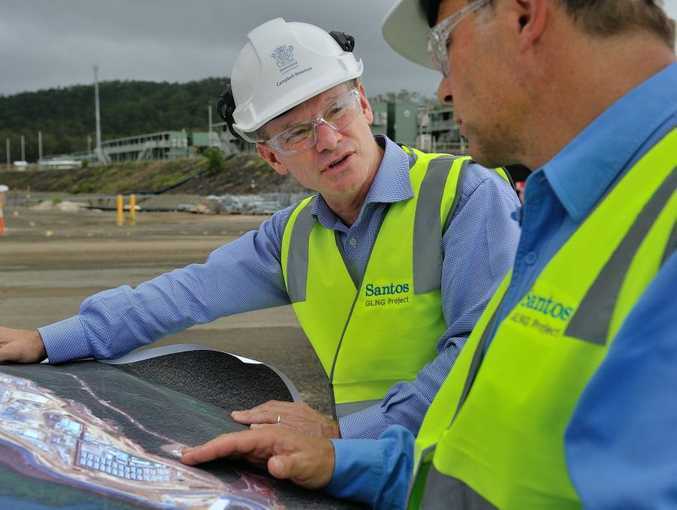 "To date, Santos GLNG has provided $5.1 billion worth of work to Queensland businesses, and over the coming decades of operation Santos GLNG will contribute billions of dollars in royalty payments to the people of Queensland." Mr Knox said that while the investment and economic contribution of Australia's gas industry was important, the real value would be measured by the company's ability to operate responsibly, "and in doing so to gain the trust of all of the communities, the individuals and the organisations that our business touches". GLNG is a joint venture between Santos, Petronas, Total and Kogas.